Sports03 has programs on his Start menu he doesn't want, but they have no uninstallers. He asked the Answer Line forum what to do. First you need to find out if you have a program you don't want, or just a shortcut. To find out, just launch it. If all you get is an error message, it's just a shortcut. Getting rid of it is just as easy: Delete that shortcut. But what if a real program loads? If it lacks an uninstaller, removing it won't be easy. Does it really lack an uninstaller? To make sure, you should look for one both in the program's Start menu submenu and in Control Panel's Add or Remove Programs applet (Programs and Features in Vista). Okay. There really isn't an uninstaller. Try to find a solution on the Web. Go to your favorite search engine and look for the program name, the version number, and the word uninstall. If that yields nothing, try remove. Hopefully, you'll find some instructions. 1) Back up your registry. Something horrible may happen in the next five steps, so be prepared. See Back Up Your Registry for instructions. 2) Find the path and file name. You'll need this information for some of the other steps. Right-click the program's shortcut on your Start menu and select Properties. Everything in the Target field to the left of the last backslash is the program's path; everything to the right is the file name. 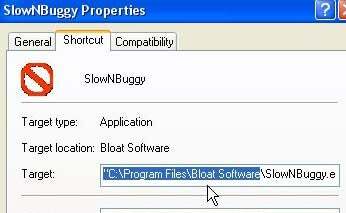 For instance, if the Target field reads "C:\Program Files\Bloat Software\SlowNBuggy.exe," then the path is C:\Program Files\Bloat Software and the file name is SlowNBuggy.exe. Keep that Properties box open. You'll need to refer to the path and file name throughout. 3) Check for autoloaders. Select Start, Run (you don't have to select Run in Vista), type msconfig, and press ENTER. Click the Startup tab. Look for anything related to the program, including anything listing the path or file name. If you find anything, uncheck it. But before you uncheck something because of its path, make sure it contains the full path. You don't want to remove everything in C:\Program Files. If you uncheck anything, you'll be asked to reboot when you close msconfig. Do so. 4) Delete the program folder. That's the path I told you about earlier. For instance, if the path is C:\Program Files\Bloat Software, go to C:\Program Files and delete the Bloat Software folder. You'll probably have to confirm the deletion. Do so. 5) Clean the Registry. There may be something left behind by your unwanted guest. See How Best Do I Clean My Registry? for advice. 6) Delete the shortcut. Close that Property window I had you open in step 2, then delete the shortcut in your Start menu. Hopefully, the program will be really and truly gone. Read the original forum discussion at http://forums.pcworld.com/message/214098.